Mother's Day is the perfect opportunity to shower your mom with delicious treats and sweet surprises. Don't be content with buying something from a store — in your own kitchen, you can whip up a fun treat with the right supplies. Before you start baking, think about a treat that your mother will enjoy and likely share with you. Thanks to the nearly endless range of cake pans, you don't have to make a boring square or round cake. Look for a cake pan that your mother will find cute or funny. 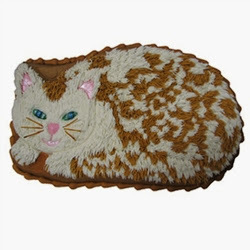 If your mom loves cats, get a cat cake pan. You can also spice up your cake by choosing from a variety of possible flavors. Although chocolate is usually a safe choice, you can be creative by baking a lemon or red velvet cake. If you think that your cake needs a little something extra, go wild with your decorations. Use frosting to add color to the cake, Americolor, for example, offers a wide variety of options to make the perfect shades. Other supplies, such as sprinkles, edible glitter, glitter dust and sanding sugars add texture and fun to your baked creations. If you're feeling adventurous, you can use a pastry bag and several decorating tips to complete your icing. These are great ways to add fun accents to your cake. Cake pops are a great way to give your mom a delicious cake-flavored treat in a small and adorable form. Creating these balls of chocolate-covered cake is an enjoyably messy project. Once you've created the pops, you can easily decorate them to suit your mom's tastes. For example, you could use some icing to make floral designs on the pops. Before you start your cake pop project, be sure to gather all of the necessary supplies, including lollipop sticks and candy melting pots. At Sweet Treat Supply, we believe there’s no better homemade Mother’s Day gift than candy. Find a shape your mom will love — purses and shoes, for example — and gather her favorite ingredients. If you’re interested in a little bonding time with your mother, there’s no better way than making candy together. Our enormous section of candy molds will keep you entertained and sure to find something to fit your interest. Cupcakes are another baked treat that you can package and personalize for a Mother's Day gift. You can use a premade cake flavor or create a recipe from scratch for your cupcakes. For best results, you'll need a muffin tin and cupcake or baking cups for your treat. After letting your cupcakes cool, you can use a variety of supplies to finish the look, starting with frosting and sprinkles. To make your cupcakes extra special, use cake toppers to give your gift a particular theme. What do you plan to give your mom this Mother’s Day? Let us know in the comments below!